HomeAid Sacramento Joins Sherwin-Williams & KB Home to Paint a Better Tomorrow. SACRAMENTO, Calif. - June 1, 2018 - PRLog -- What a big difference a simple coat of paint can make! 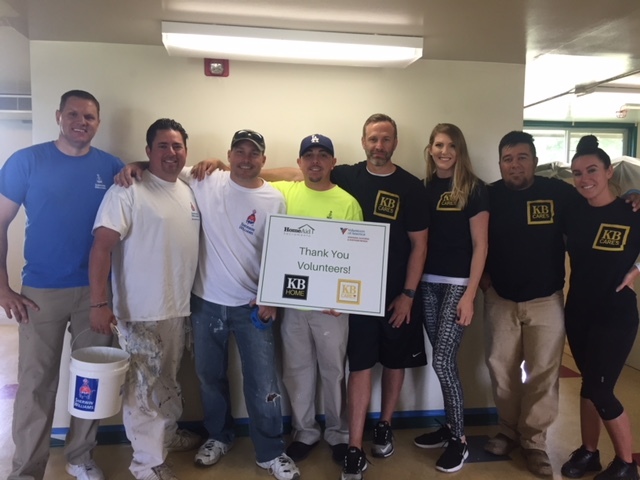 As part of Sherwin-Williams' National Painting Week HomeAid Sacramento facilitated a Painting a Better Tomorrow event held at Volunteers of America's Mather Campus on May 30, 2018. Sherwin-Williams generously donated paint and supplies for the project and their employees joined volunteers from KB Home to give their time to refresh one of the classrooms on the Mather Campus. Volunteers of America works to prevent and end homelessness through a range of supportive services including eviction prevention, emergency services, transitional housing and permanent affordable housing. Sherwin-Williams, a national leader in the paints and coatings industry, recently joined HomeAid America as a Gold Level National Partner. "HomeAid is exactly the type of organization that Sherwin-Williams is proud to stand behind," said John Morikis, Chairman, President and CEO of The Sherwin-Williams Company. "Their mission to connect homeless families and individuals with safe and accessible housing aligns with our Company's values and philanthropic priorities." Improving the lives of those who call a shelter "home" is what Painting a Better Tomorrow is all about. HomeAid Sacramento holds several Painting a Better Tomorrow events throughout the year—choosing a shelter partner in the Sacramento area who has a dire need for a fresh coat of paint. The one-day events are an excellent opportunity for volunteers from the home building industry to use their skills, enjoy a great team building event, and give back to those in our community who need it most. Since its start in 2006, volunteers have given over 9200 hours of community service through the Painting a Better Tomorrow events. KB Home, an important building partner with HomeAid Sacramento, sent ten volunteers to join in the painting event on the Mather Campus. The volunteers were excited to spend their day with paintbrush in hand for this worthy cause. Everyone who participated in the event felt deeply satisfied as they stood back at the end of the day and viewed the newly refreshed classroom. To join in the next Painting for a Better Tomorrow event or to make a donation to HomeAid Sacramento please contact Vangelina Chang: vangelina@homeaidsac.org.